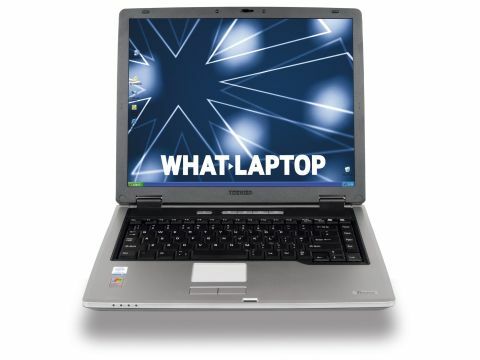 Toshiba has been producing laptops for 21 years with the bulk of its business aimed at the corporate user. The Toshiba Tecra A3X (£561 inc. VAT) is a standard model within the corporate range and has been designed as an office tool. To this end, you'll find decent value for money, but the machine lacks cutting edge features. Powered by an Intel Celeron M 370 chip, which runs at 1.5GHz and is supported by 512MB of DDR2 memory, there's a reasonable amount of performance to be had, but don't expect this machine to handle anything other than everyday tasks. This was borne out with a MobileMark 2005 score of 187. The chassis is built of silver and black plastic and while we found the main body to be solid and robust, we were disappointed by the two small hinges holding the screen in place, as the panel tended to rock gently back and forth as we typed. The 15-inch TFT panel comes with a standard 4:3 aspect ratio and a native resolution of 1024 x 768 (XGA). Graphics come in the form of an integrated Intel 915GM chipset, which uses a portion of system memory, in this case up to 128MB. You won't be able to run anything too complex using this adapter, but for office tasks and browsing the Internet it's more than adequate. The keys are of a good size with plenty of travel, but we found the keyboard to be rather spongy, so typing proved tiresome after a while. The touchpad is of a good size, but the mouse buttons are small. Fortunately, both are accurate. Fitted with an 802.11a/b/g adapter you'll be able to connect this machine to any Wi-Fi network with ease. Tecra machines use a standard array of peripherals, so if you're buying a number of machines for an office, you can share resources, such as docking stations and peripherals. Weighing in at 2.6kg, this is a fairly lightweight solution. Sadly, battery life wasn't up to standard, with our tests recording a result of 137 minutes. To keep costs down, you'll find the optical drive is an older DVD/CD-RW drive, which means you can write CD-R discs, but not DVD-R. You can read data from DVDs, either as programs or DVD movies, though.